Hi, I am Jane Lauriston Seigal. I have lived in London, Devon and France. My background was Fleet Street (when it really existed!) and amongst others, I worked for Press Association, News Corp and Stud & Stable. Raising my family on Dartmoor, I ran a hotel there and was Chair of various tourism associations and not for profit companies like The Dartmoor Tourist Association and Okehampton OK Ltd. I have always written and turned out many tourism articles when living in the West Country. Now retired in charming S.W. France I am writing all the time. 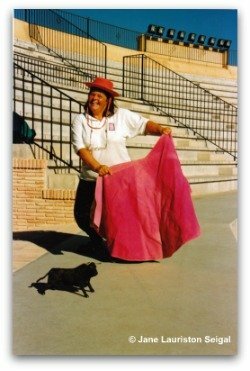 My latest project is an emotional and heart rending story about a Spanish rescue dog. I am still writing travel articles but now about Europe where I travel extensively. I do a fair bit of scribbling some of which is published, most not!! I do it for the love of it, to keep records for us and to preserve memories, which are more than cherished. I do not purport to be a travel writer in the true sense of the Rough Guides which I use constantly. But I think I am quite knowledgeable in my field i.e., what most of us look for, real ‘living’ locations in both urban and rural areas where life goes on as it always has. I actively seek them out, try and get under the skin and enjoy every moment. If anyone needs advice on really out of the way places to aid with the natural recharging of one’s batteries, please ask me. 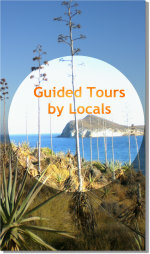 I love doing itineraries offering tranquillity and nature. Just give me a rough idea of where you are going and what you like. Written from the perspective of a destitute Spanish street dog, this book covers the first 6 years of Pastora’s dramatic and harrowing life. 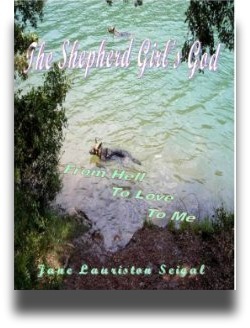 Wrenched from her mother’s love before she is fully weaned, she learns to escape death on a daily basis. Her enemies are not only the older and far more wily wild dogs but one particular member of the Guadia Civil! As a puppy, her plight appears hopeless and then the insistent murmurs start. At first they are vague, uneasy qualms, but her world is so shocking she has no inclination to question the spirits that are surely there. When the most horrific of traumas surpresses any desire for life and at the point of giving up forever, she is swept along a route she would never have taken. Life settles down to a more regular existence and then the whispers become a voice, a voice she cannot ignore – a voice that in the beginning, terrifies her. But soon the mystifying words become something she can never be without. Her path is chosen and her destiny is shaped. As her life changes yet again and she is rescued by a loving couple, adventures of a different kind present limitless opportunities. Her voices frequently reprimand and encourage her but her wild abandon and free spirit never leave and life is not as comfortable as it should be. Gradually she learns to love again, really love. But life can never stay the same and she loses her mate leaving a gaping void that could never be filled, or maybe it can! She gains another friend – a very different personality and one who needs a great deal of training. Her constant questions are almost answered but her belief becomes absolute. 50p of all sales goes to the charity Paws Patas, a Spanish dog rescue organisation where we found Tara.